I was inspired to write this piece based on a note card that I was allotted during a program training. 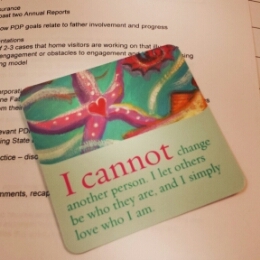 The note card read the affirmation “I cannot change another person. I let others be who they are, and I simply love who I am”. How beautiful and simple is this affirmation? Yet how complex do we make our lives by trying to change others. By expecting from others what they are not capable of giving and in turn becoming upset and bothered because they “don’t change their ways”, “don’t see the harm or wrong they are doing” and “don’t become the person they are capable of being” . Yet this complexity comes from our mere expectations of how we perceive that person and the belief that we have that the individual is capable of changing, knowing better and of other possibilities that are further than who they currently are. This can be related in terms to personal and interpersonal relationships, family members, employees, clients, students, children, and spouses; in general just about anyone in any given circumstance. We and I refer to “we” as human beings in general tend to think that we are right, that we hold a higher morale and that the way that we do things are the “right” ways to do things. That because we have accomplished certain things in life and possibly attained prestige and status in any given platform that we are now the expert in telling others how to live their lives. The reality is we have no right, no stand and no justice in telling another individual how to live their lives. We do not know the path that God has constructed for them and what their entire past, generations back consists of. Therefore the saying “Only God can judge me” takes stand. It is not fair of me to impose what my beliefs are on to another person, even if it is clear as day that I am trying to help this individual change their lives and attitudes and ways. It is unfair because it is not my life to live. It is their journey and their challenge, their trials and their triumphs. So why is it so complex? It becomes so complex because some things in life we know can be tweeked and worked on to become better. Knowing that a significant other has a bad attitude or handles their money or time irresponsibly will have some sort of effect on me and so perhaps my motives and intent to help this individual come from a solid place, a place out of love and not contempt or judgment. Bettering this individual or advising him or her is for the benefit of seeing this person progress and grow and find their own wings to soar on. But the truth is that no one likes to be told what to do. Very few can handle constructive criticism. And many see constructive criticism as you trying to have a hold over them, a sense of power or control and dictate their lives. Over the course of my seven years as a family support worker I have had to let go of the notion that I was able to change a person and save them from their demise. Truth be told it is so hard to change ourselves and our own bad habits and attitudes that it is impossible for us to change another individual. It’s just not going to work. Personal experience has taught me that even when I know that my advice and words of encouragement are going to benefit the person I cannot impose my ways on another person. It just doesn’t work. I knew this man once. He was a charmer, savvy and witty and very well known. Though he had his great qualities (as we all do) he also had his dark side (as we all do as well). However, this man’s attitude would become the epitome of his fall. He was not a rational person, was quick to anger, hot tempered and walked crooked paths. Still, I wanted to bring light to this individual, to help him see his ways and assist him in transforming his ways and his life. I would advise him and suggest ways that he could handle different scenarios in positive manners rather than negative. At first it seemed that my support was in fact softening his heart, he was making changes. He thought things thoroughly, used rationale and starting making positive changes. But unfortunately he would revert to his former self and former ways and in the end I became a victim of his behavior. I mention that because I think it’s important that we always lend a helping hand and assist others on their journey when it is asked for. Unsolicited advice is not welcomed advice. This is just the truth. Unless a person wants to change for themselves and has recognized his or her negative behavior he or she WILL NOT change. Change has to come from the freedom to choose to change because there is acknowledgment that there needs to be change. Change will not come from a new relationship, new friendships or new employment. Although all those factors lead to change they will not create permanent change unless the individual is willing and ready to make those changes. “I cannot change another person. I let others be who they are, and I simply love me”. I cannot change another person. I can only assist them in their journey if they choose to ask for my help because at that point they are ready for change or at least to take the first step towards change. I cannot change another person. I can only plant seeds in the hopes that in the future they will remember the seeds that I had planted and perhaps allow those seeds to flourish. Everyone has the freedom to choose his or her own path of life. Even though we know in truth that some behaviors will lead to destruction we need to acknowledge that we can try to save a life but ultimately that person has the free will to do as they please. We must accept that and be okay with it. Let others be who they are. Whether they are good people or bad people, just let them be. You don’t need to surround yourself with toxic people but you can accept that there will be and are toxic people in the world and just let them be who they want to be. It is their choice. Be at peace with that. It is their choice. There was a point in time where an individual brought me down so low in my life that death looked like a sweet escape. (Scary thought but true)Don’t allow toxic people to bring you down, to impose their negative beliefs on you and for you to internalize those beliefs. Toxic people bring toxicity and chaos and madness into your life. Love yourself completely. This takes time. The first step is to remove yourself from a toxic relationship or environment and meditate on how unique and special and amazing you are. Love yourself exactly how you are. If there’s something you absolutely can’t stand to love about yourself seek deep prayer and counseling services if necessary. If you can change what it is that you don’t like about yourself then do so, but only do so if it’s because YOU don’t like it and YOU want to change it not because of the self imposed toxicity that someone imprinted in your heart or your mind. I heard it all before. Being told that I had nothing to offer in a relationship or in a family. Being told that my education is worthless because I didn’t have a high paying job. Being emotionally and mentally abused. I wasn’t “pretty enough or my ears were too big or my nose looks like a pig’s nose, my forehead was too big”. Sad right? What’s worse is that there was more and I could go on. This person wasn’t always like that but those things stuck in my mind. I even contemplated surgery to “fix” those things that were problems. I saw myself the way this person saw me and I hated myself. But in time I have learned to start liking myself in the hopes that someday in the future I will whole heartedly love myelf. I ended up looking back at pictures that I took during that time in my life. I felt so ugly back then, and just getting a bit of clarity in my life has made all the difference. I see the person I was and there was nothing wrong with me, just a broken spirit. Simply love yourself. Allow people to be who they are and walk the path that they choose to walk and continue on the path that you are on and if you want to change paths that’s ok too so long as it’s the choice you want to make. Let others be who they are. If they are ready to change and want to help then do so but if they are not and don’t want to or do but revert to their old ways then let them, just pray for them. That’s all you can do. And if it’s you that wants to do the changing then do it for yourself not because someone else wants you to change because in simple terms “it’s not fair”.